This cantaloupe never stood a chance against this double-edged sword. Nor did the numerous cabbages that met their demise in the combat demonstrations. Who doesn’t dig chicks with longbows? 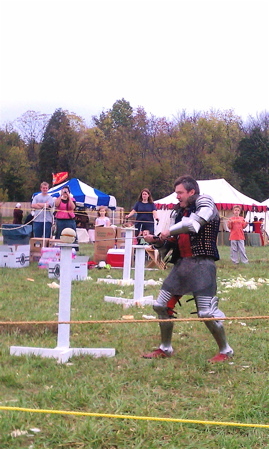 We took the kids out Saturday to see the Days of Knights at Sky Trail Park in Frankfort. You could call it a renaissance festival, but it wasn’t quite to that level. It was more as billed – A Medieval Experience. I only discovered Sky Trail Park last week, after taking the dog for a walk out there. It’s a beautiful park with a 1/2 mile walking track that weaves through the trees and offers fantastic views of the area around Buffalo Trace Distillery. It is part of Cove Springs Park, but the upper portion. Take the first right after going up the hill on US 127N. Signs lead to a gravel road that will deposit you at Sky Trail Park. The experience was three days, October 12-14, long enough for participants to set up camp. There were a variety of tents, some small, for foot soldiers and peasants, others immaculate, like that for the king, that contained king sized beds on raised platforms, a sitting area and fires. All were laid out and in the fashion of medieval times. Arriving at this event was curious. It was an overcast afternoon, and the smell of wood fires filled the air, some of which were actually cooking stews for supper. Horses were kept off to one side of the field for the jousting, and lanes were established in the center for this lanced competition, with stands erected for spectators to observe. Several knights were attacking one another with swords and spears as I walked into their realm. There were no vampires or Harry Potter-types mucking about. From the textiles, to dialects of speech, mannerisms, costumes and weapons – all were given considerable effort to make for a more believable experience. And speaking of weapons there were a lot of them – battle-axes, swords, spears, daggers, shields and the ever popular chain with swinging mace. Our 7 and 9-year-old boys were all over this stuff, and the participants were gracious in spending time to explain the uses of each, and allowing everyone to handle the items. Many of the men were walking around in full mail and plate armor, for display, but also for the hand-to-hand combat demonstrations and the jousting matches. In the staging tents kids and adults could try on some of the mail, that mesh garment worn under armor consisting of small metal rings linked together that would help prevent glancing sword blows. It’s amazingly heavy, as was the plate armor, especially the helmets. Several discussions were led about the purposes of the armor, its limitations, and how it was improved over time. Sword demonstrations showed the various types and designs – and through the slicing and dicing of many cantaloupes and cabbages it was apparent how sharp these implements were. There was a crossbow competition, and longbow archery for men, women, and one for children under 12 – all in costume. That was cool. All clear down range – the trebuchet is set to fire. May the heavens rain pumpkins upon thou castle. 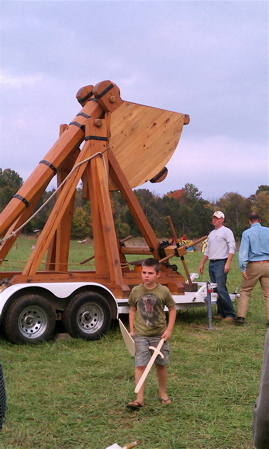 Right before we left, around 5:30 p.m., they cranked up the extraordinarily crafted trebuchet that was provided by the Virginia Military Institute. These guys were engineers and not dressing out, but they let attendees and participants help crank the rope. This kin to the catapult slung 20 to 40 pound pumpkins down range a good 50-yards or more towards a mock-castle, getting considerable height in the air. It was impressive in construction, ability and accuracy. Also, there were some of the earliest versions of guns, known as handgonnes, firing away in the background. The cannon was powerful enough to crack its base. It all made for an amusing atmosphere. The boys particularly enjoyed the blacksmith, who was crafting fireplace implements from his bellows and hammer. The question that kept going through my mind was what were these folks all about? There was considerable effort, time and financial investment on display at the Days of Knights. There was a hierarchy in the roles played, from the king down to his knights, villagers, maidens and serfs. How one becomes part of this motley crew from the Middle Ages I don’t know. Perhaps you can buy your way to status, but all in the camp seemed to be enjoying their roles and took them seriously. As the hour grew late and attendees started heading for their modern mechanized vehicles, the buzz around camp was for the flaming arrow shoot set for later that night. The camp closed to the public at 6:00 p.m. The rest of the evening was rightfully reserved for participants only. This entry was posted in Events, Family. Bookmark the permalink.